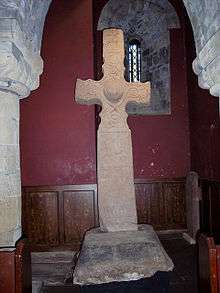 The Dupplin Cross, now in St Serf's Church, Dunning, on which Causantín mac Fergusa is commemorated as Custantin filius Fircus[sa]. Causantín or Constantín mac Fergusa (English: "Constantine son of Fergus") (before 775–820) was king of the Picts (or of Fortriu), in modern Scotland, from 789 until 820. He was until the Victorian era sometimes counted as Constantine I of Scotland; the title is now generally given to Causantín mac Cináeda. He is credited with having founded the church at Dunkeld which later received relics of St Columba from Iona. It had been proposed that Causantín and his brother Óengus were sons of Fergus mac Echdach, King of Dál Riata, but this is no longer widely accepted. Instead, it is thought they were kin to the first king Óengus mac Fergusa, perhaps grandsons or grandnephews. This family may have originated in Circinn (presumed to correspond with the modern Mearns), and had with ties to the Eóganachta of Munster in Ireland. Causantín's reign falls in a period when Irish annals have relatively few notices of events in Scotland, possibly due to the failing of the annals believed to have been kept in Scotland at Iona and Applecross. Perhaps for that reason, there are only two reports which mention him. Other entries make it clear that the Vikings were active in Ireland and on the western coasts of Scotland in this time, which may also account for the lack of records. Iona was a target, and it may be that Abbot Noah of Kingarth, on the Isle of Bute, was killed by raiders. The first report, in 789, is the record of a battle in Pictland between Causantín and Conall mac Taidg, in which Causantín was victorious. Conall later reappears in Kintyre, where was killed in 807. It is not known whether Causantín was king before defeating Conall. The king lists give varying lengths for his reign, from 35 to 45 years, and are not to be relied upon without independent confirmation. The second report is that of Causantín's death in 820. The Dupplin Cross was long assumed to commemorate Cináed mac Ailpín's final victory over the Picts, as indeed, was Sueno's Stone. Recent analysis has revealed a small part of an inscription on the Cross, in which Causantín is named. Accordingly, it is supposed that this monument was commissioned by him, or as a memorial to him. He appears there as Custantin filius Fircus[sa], a Latinisation derived from the Old Irish version of his name rather than the presumed Pictish form Castantin filius Uurguist found in the Poppleton Manuscript and similar Pictish king lists. 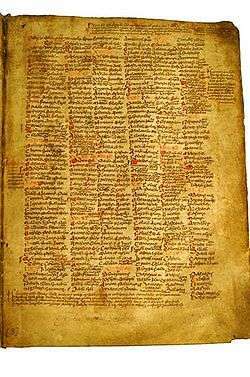 The Martyrology of Tallaght (University College Dublin Ms. A3) from the Book of Leinster, c. 1180. It has been proposed that the St Andrews Sarcophagus was made for Causantín, but this is a minority view, as is the suggestion that the relics of Columba, perhaps including the Monymusk Reliquary, may have been translated from Iona to Dunkeld during Causantín's reign. The idea that Columba's relics may have come to Dunkeld in the time of Causantín, rather than thirty years later in the time of Cináed mac Ailpín is based on an entry in the Chronicon Scotorum for 818. That Causantín established Dunkeld is stated by later chroniclers such as John of Fordun who are following some variants of the Pictish king lists or other materials now lost. Andrew of Wyntoun dates the foundation to 815, although he states that this was after the deaths of Charlemagne and Pope Leo III, which would date it to 816 or later. It is suggested that Causantín is commemorated by the Martyrology of Tallaght, a product of one of the principal céli dé monasteries of the day. As a patron of the céli dé, and perhaps a collaborator of Abbot Diarmait of Iona, it is thought that Causantín may have been a church reformer, in line with céli dé ideals. Caustantín appears also to have been a patron of the Northumbrian monasteries, as he is commemorated, along with his nephew Eogán, in the Liber Vitae Dunelmensis, which contains a list of those for whom prayers were said, dating from around 840. Causantín was succeeded by his brother Óengus. His son Drest was later king. Causantín's son Domnall is believed to have been king of Dál Riata from around 811 until 835. Causantín's reputation among the kings who followed him may, perhaps, be demonstrated by the use of his name on for three kings in the century and a half following his death when it is not attested as a kingly name in Scotland prior to his reign. CELT: Corpus of Electronic Texts at University College Cork includes the Annals of Ulster, Tigernach, the Four Masters and Innisfallen, the Chronicon Scotorum, the Lebor Bretnach (which includes the Duan Albanach), Genealogies, and various Saints' Lives. Most are translated into English, or translations are in progress. The Martyrology of Tallaght is not presently available. 1. Broun, "Pictish Kings", p. 82, table 67; Clancy, "Caustantín"; Woolf, "Onuist".